April 25, 2012  In Britain Wednesday, media mogul Rupert Murdoch appears before a panel to testify about contacts with leading British politicians at a time when his News Corp. was trying to takeover broadcasting group BSkyB. On Tuesday, Murdoch's son appeared before the same panel. April 24, 2012  News Corp. chairman Rupert Murdoch and his son James are to appear this week before a panel investigating the practices, culture and ethics of British press. The Murdochs are expected to be asked about the extent of their knowledge of phone hacking by their newspapers. April 23, 2012  U.S. and Afghan officials have finalized their partnership agreement, which sets up guidelines for U.S. involvement as American forces leave that country. Details have not been released, but both governments hope the agreement will put to rest doubts about a long term American commitment to support Afghanistan. April 17, 2012  The Dalai Lama stepped down as the politic leader of Tibet's government-in–exile a year ago to devote himself to spreading a spiritual message of compassion and peace. Still, he's been drawn into talking about violence since a wave of deadly protests swept through the Tibetan areas of China. He talks about those events with Renee Montagne. April 11, 2012  North Korea says a three-stage rocket on the launch pad will carry a weather satellite into space. The launch is intended to mark the centenary of the birth of North Korea's founder, but the move has been condemned by the United Nations, the United States and North Korea's neighbors. 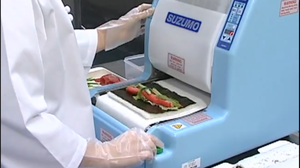 April 10, 2012  Wired reports that "sushi bots" were among the eye-catching products at the World Food and Beverage Great Expo, which just wrapped up in Tokyo. April 10, 2012  The new Major League Baseball season isn't even a week old, and already there's controversy brewing. Ozzie Guillen, the new manager of the Miami Marlins, is holding a news conference Tuesday to apologize for recent comments he made about Cuban leader Fidel Castro. April 9, 2012  The first weekend of the Major League Baseball season is over, and already there are some early surprises. In New York, the Mets are 3-0, while the Yankees are 0-3. April 4, 2012  Roughly half the delegates to the GOP nominating convention have now been chosen, and Mitt Romney has emerged as the prohibitive favorite — eager to lead the party against President Obama. So how does he use the next five months until the convention begins? March 28, 2012  Arab leaders were gathering in Baghdad for the first Arab summit in the Iraqi capital in decades. The government has spent $500 million preparing for the meeting — including a huge security operation in a city still the scene of bombings and other attacks. March 15, 2012  Defense Secretary Leon Panetta is in Afghanistan on a long-planned trip that has turned into something of a fence-mending mission. A U.S. soldier is accused of killing 16 Afghan civilians. That attack is the latest in a series of negative events involving U.S. forces. March 15, 2012  Defense Secretary Leon Panetta is meeting with Afghan President Hamid Karzai Thursday. A U.S. soldier is accused of killing 16 Afghan civilians in Kandahar on Sunday. The incident has raised questions about the future of the U.S. mission in Afghanistan. March 14, 2012  Judges at a war crimes tribunal convicted Congolese warlord Thomas Lubanga of snatching children from the street and turning them into killers. A sentencing hearing will now be scheduled. Lubanga faces a maximum sentence of life imprisonment. March 13, 2012  U.S. officials have not released the name of the U.S. soldier accused of killing some 16 Afghan civilians in southern Afghanistan over the weekend. The shootings come as anti-Americanism already is boiling over in Afghanistan after U.S. troops burned Qurans last month. March 7, 2012  President Obama began Tuesday's news conference talking about the U.S. housing market. He said in many ways the U.S. economy is getting stronger but millions of Americans can't find jobs, and millions more are having trouble paying the rent or mortgage.